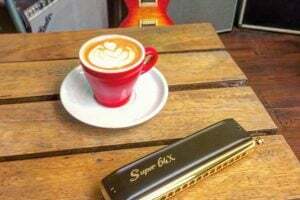 To help you choose the best harmonica for your needs, we’ve put together a series of buyers’ guides. 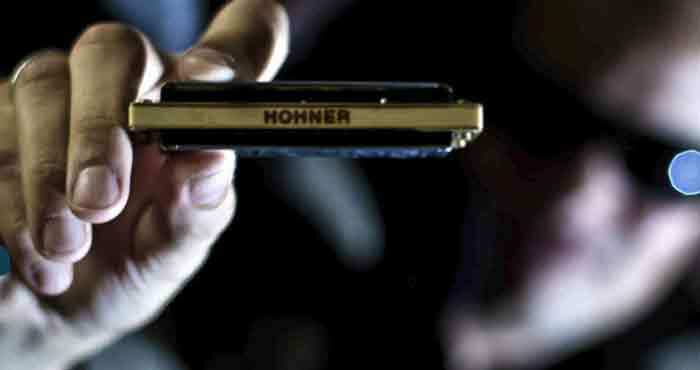 As it’s the biggest and arguably best knowm harp maker, we’re starting with Hohner. There are some brands whose names become so synonymous with the products they manufacture that the brand itself becomes the generic noun used to describe all similar items. Hoover is an oft-quoted example of this, but there are others, including, incredibly, ‘Bubblewrap’ and ‘Ping Pong’. Whilst the brand ‘Hohner’ might not be quite so interchangeable with the word ‘harmonica’, it’s safe to say that it would probably be the first company the average person would think of if asked to name a manufacturer of the instrument. Founded in Trossingen in the south west of Germay in 1857 by watchmaker, Matthias Hohner, the company can lay claim to being one of the oldest extant harmonica producers in the world (the honour of oldest actually goes to compatriots and rivals, Seydel, who were established ten years earlier). Trossingen at the time was the centre of a watchmaking industry, and it was, perhaps, the availability of craftsmen familiar with working with relatively small parts that led to it becoming a hub for harmonica production. Christian Messner, a former watchmaker from the region, was the first to establish a workshop manufacturing harmonicas in Trossingen in 1827. His instruments were produced by hand, by a single craftsman in the artisan tradition, and, although laborious to make, were relatively crude instruments. Matthias Hohner, however, beginning his operations 30 years later, was able to see the benefits of production methods and technologies that had begun to appear in the latter part of the industrial revolution. He replaced humans with machines where the latter could be more accurate than the former, instituted division of labour and adopted innovations such as using brass for the reed plates instead of moulded lead. 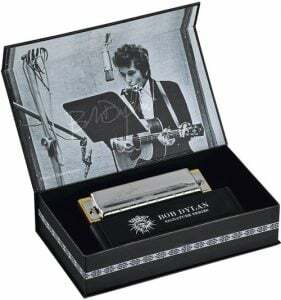 This, together with the company’s adoption of protective covers for the harmonicas resulted in an instrument that was of the highest quality available at the time, but at a price point that was competitive. Hohner harmonica design from the 1860s. Demand for harmonicas grew throughout the following decades, with export trade to America being particularly high. By 1879 Hohner was producing around 72,000 harmonicas a year and employing over 200 workers. 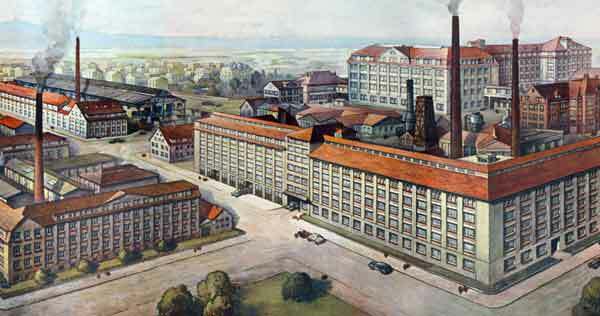 At the start of the 20th century, Matthias handed over the business to his five sons, who continued to develop export markets and refine the company’s manufacturing processes. By 1930, Hohner had acquired a number of its competitors and had become the largest musical instrument company in the world, employing around 4,000 people. The pre-WW2 period was, perhaps the golden age for Hohner harmonica production, with numerous popular musicians from the blues, folk and western genres utilising its distinctive sound in their recordings. Despite the interruption of the Second World War, and the enlisting of the company by the Nazis to produce detonators for the war effort, Hohner continued to flourish in the 1950s, with large numbers of its harmonicas finding their way to export markets. 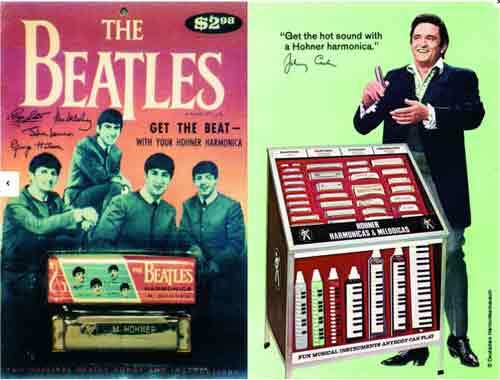 The rise of rock’n’roll, however, with its focus on the triumvirate of guitar, bass and drums, led to a precipitous drop in sales of Hohner’s harmonicas in the early 1960s. Even the use of the instrument by the two biggest acts of the decade – The Rolling Stones and The Beatles – couldn’t seem to reinvigorate the market. The 1970s and 1980s saw diversification into electronic instruments, and disastrous financial results, culminating in a takeover by Kunz Holding, a subsidiary of the Taiwanese musical instrument company, KHS, in 1987. This all eventually reaped rewards, though, when in 2001 the company posted its first profit in 20 years. Today Hohner produces a wide range of harmonicas, and the number of models can sometimes be a little bewildering. Let’s take a look at the various ranges and explain the key differences. This is, perhaps, the most famous name in the lineup. First produced at the end of the 19th century, it was later adopted as the instrument of choice by blues, folk and pop artists, from Jimmy Reed to John Lennon. All models are made in Germany. Classic: the original Marine Band with a pearwood lacquered comb and brass reedplates. Deluxe: improved comb design for greater volume, triple lacquering for longevity and an Ultraglide coating for comfort. Crossover: triple lacquer bamboo comb for a brighter sound, Modern Compromise Tuning. Thunderbird: bamboo comb, tuned an octave lower than standard. 364/24: 12 hole version of the traditional Marine Band. 364/24 Soloist: 12 hole version with solo tuning. 365/28: Upper register is expanded to two more holes over the 364/24. These are more modern looking harps, with ABS mouthpiece surfaces and combs, arguably providing better comfort and less chance of swelling than wood. All Progressive Series models are made in Germany. The Rocket: designed to be loud and comfortable to play, with a comb that features rounded sides and edges. Rocket Low: similar design to The Rocket, but available in the keys of LC, LD, LEb, LE and LF. Rocket Amp: features the same construction as The Rocket, but has covers without side vents to facilitate playing with a microphone. Special 20: this was the first Hohner harmonica to be manufactured with a plastic comb, potentially making it more airtight and less prone to swelling than wooden combed harps. Many modern harmonicas from other manufacturers are based on the Special 20. Golden Melody: this is a retro-inspired model with rounded edges. Because it’s tuned to equal temperament it’s most suitable for single note playing. This line of harps features modular construction, enabling covers, reed plates and combs to be swapped between harmonicas. All MS Series models are made in Germany. 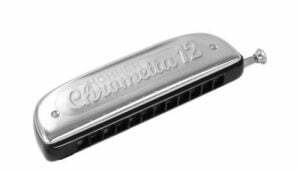 Blues Harp: features a doussie comb and mouthpiece surface and stainless steel covers. Big River Harp: this model has a plastic comb and streamlined covers with side vents. Pro Harp: black ABS comb and black coated mouthpiece surface. Particularly popular amongst rock musicians. The Meisterklasse: features full length cover plates, an aluminium comb and slightly larger nickel-coated reed plates. 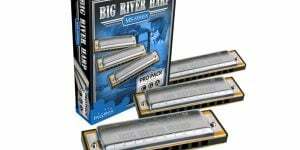 These are entry level harmonicas, made in China, that are competitively priced and are designed primarily for beginners. Blues Bender PAC: Patented Acoustic Covers are designed to facilitate note bending. Plastic comb and mouthpiece surface. Pocket Pal: plastic comb and mouthpiece surface, screw assembly for easy maintenance. 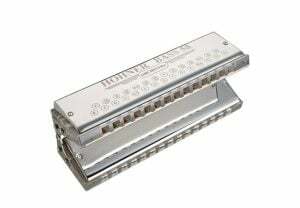 Blues Band: features a plastic comb and mouthpiece surface. Hot Metal Harp: similar to the other models in the Enthusiast Series, but with a sound more orientated towards hard rock. Silver Star: a robust beginners’ model with a plastic comb and mouthpiece surface. 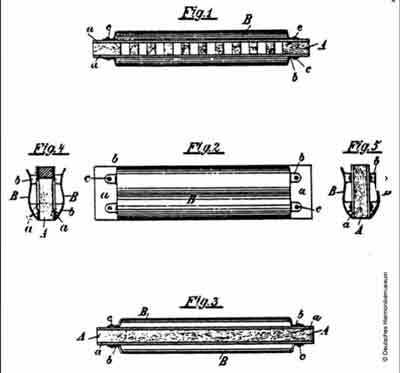 Chromatic harmonicas consist, effectively, of two harps, tuned a semitone apart and separated from each other by a slide, which is operated by a button at the side of the instrument. So, in the case of a chromatic harp tuned to C, when the button is not activated, the harmonica will have the notes of the scale of C major available. Conversely, when the button is depressed, the notes of C# major are available, meaning that a chromatic harp can play in any standard Western key. This is particularly useful in jazz and classical music, where the chromatic has seen the most use. These are entry level chromatic harps available with various ranges, from 2 to 3.5 octaves, indicated by the number in the model name (ie Chrometta 8 has two octaves, Chrometta 10 has 2.5, etc). The CX12 Series models are made in Germany and feature a single unit integrating the mouthpiece and covers, which can be disassembled without using any tools. CX12 Black: injection moulded plastic comb, 1.05mm brass reed plates and a plastic mouthpiece surface. CX12 Jazz: narrower mouthpiece and a red/gold finish. CX12 Gold: thicker reed plates for a louder acoustic sound. Gold anodized casing. Particularly suited to classical pieces, and other instances where volume is required without amplification. The Chromonica models share common design features with the original chromatic harmonica first manufactured by Hohner in 1912. Chromonicas are all made in Germany. Discovery 48: entry level model in the Chromonica range, featuring 48, 1.2mm brass reeds, a straight slide and an ABS comb. Toots Mellow Tone: thinner reed plates (1.05mm) and a pearwood comb, give this harp a warm sound. The mouthpiece surface is chrome, rather than ABS and the reed plates are nickel coated. Toots Hard Bopper: similar to the Mellow Tone but with thicker reed plates (1.2mm) for a more powerful sound. Chromonica 40: classic Chromonica model, with a 2.5 octave range, pearwood comb and 1.05mm brass reed plates. Super Chromonica (AKA Chromonica 48): similar to the 40, but with a full 3 octave range. Chromonica 48 Gold: special edition of the 48 with gold cover, reed plate and mouthpiece surfaces. Super Chromonica Deluxe: similar to the standard 48, but with thicker (1.2mm) reed plates for greater volume and response. Chromonica 64: full 4 octave range and an ABS comb. Extra octave is in the lower range. 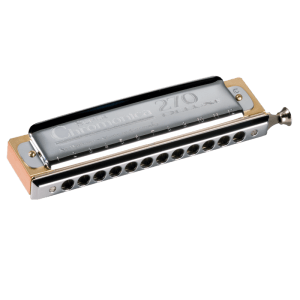 These are the top end Hohner chromatic harmonicas and are designed for the needs of expert and professional players. 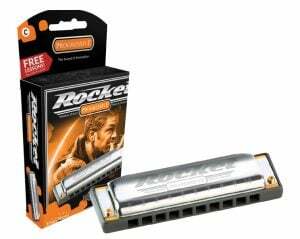 ACE: this very modern looking harmonica features Acoustic Coupling Elements, enabling the user to modify tonal colour, and a VarioSpring system, which allows easy adjustment of spring pressure. 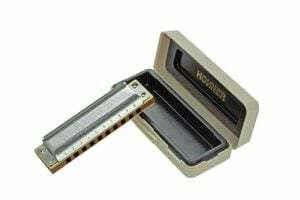 Silver Concerto: Hohner’s most exclusive harmonica is built to order and features a sterling silver comb and silver plated mouthpiece surface. Amadeus: 3 octave range, gold plated mouthpiece surface and a CNC milled transparent acrylic comb. Meisterklasse: designed specifically for classical players, this harp has a 3.5 octave range from G – C, an aluminium comb and 1.2mm brass reeds. 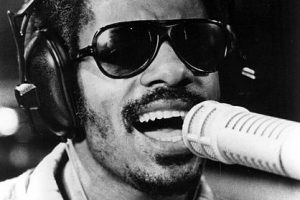 Super 64: 4 octave chromatic harmonica, used by Stevie Wonder on many of his hits. ABS comb and silver plated mouthpiece surface with round holes. Super 64X: similar to the standard Super 64, but with a transparent polycarbonate comb and double thickness reed plates in the bottom two octaves. These types of harp have two reeds per note – one tuned slightly sharp, the other slightly flat – which gives a distinctive warbling note, particularly suited to traditional folk music. Echo 2×32: features a maple comb, and is double-sided, giving the keys of C and G in one instrument. Echo 2×48: similar to the 32, but with 2 x 48 reed plates, giving a greater range. 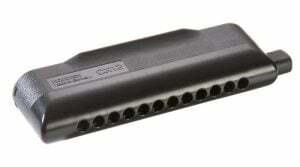 Echo 32 Tremolo: standard 32 hole tremolo harmonica featuring a maple comb and mouthpiece surface. Echo 48 Tremolo: similar to the 32, but with 48 reed plates for a larger range. 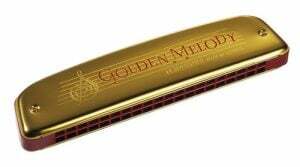 Golden Melody Tremolo: 40 hole model with a plastic, rather than wooden, comb, to eliminate swelling. Kreuzwender: six separate tremolo harmonicas in different keys, joined together by metal stars at the end. Each harmonica can be chosen by rotating the instrument. 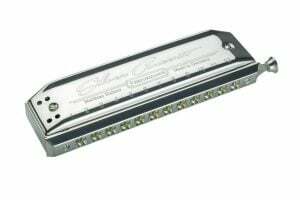 Ocean Star 48: 48 hole tremolo harmonica tuned to give a slow tremolo effect. Big Valley 48: 48 hole tremolo harmonica with a particularly bright sound. ABS comb and mouthpiece surface. Octave harmonicas, like tremolo harps, have two reeds per note, but instead of being tuned slightly sharp and flat they are tuned an octave apart, giving a very powerful sound. Like tremolos, octaves are most widely used in folk music. 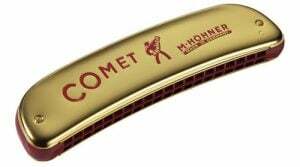 Comet 40: 40 brass reeds, injection moulded plastic comb and 0.9mm reed plates. Unsere Lieblinge 32: traditional 32 reed octave harmonica with a maple comb. Unsere Lieblinge 48: 48 hole version of the 32. These are designed primarily for ensemble playing and are produced in melody and chord versions. Chord 48: 384 reeds, enabling 48 different chords to be played. Bass 58: 29 hole, 58 reed instrument, with reeds tuned an octave apart for a deep, rich sound. Bass 78: 78 reed version of the Bass 58. Hohner also produces signature models, such as the Ozzy Osborne and Bob Dylan harps, which are based on the instruments used by the artists, but customized to give them a unique look and feel. 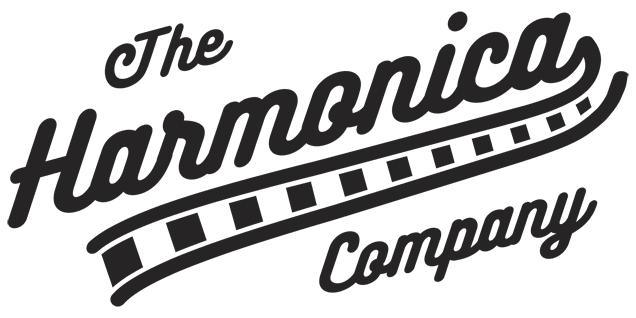 Hopefully this will have helped you to determine the correct Hohner harmonica for your needs and playing style, but please drop us a line by phone (01373 469777) or email (sales@theharmonicacompany.com) if you have any questions. Write about all things harmonica-related at The Harmonica Company. 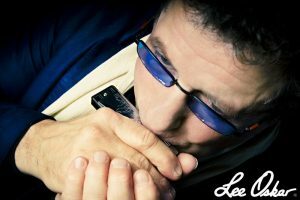 Director of SpecialtyCoffeeHome.com Classically trained pianist, self taught guitarist and harmonica player. Also play bass and drums (badly). Have a whole bunch of largely irrelevant qualifications. Many years ago, I was given a Chromatische mendharmonika (Chronomonika III 870). It’s a beautiful instrument, and it’s never been touched. Now that I finally have to time to try to learn – What is the best way? [I do read music.] Tx!